Adopting a rescue dog is an exciting event for you and your family, but it can prove stressful for the pup. Introduce your dog slowly to his new home and all of his new housemates, using positive reinforcement techniques to encourage him to relax. With time and love, your adopted pooch will become acclimated to his new surroundings, settling in as a welcome addition to your family. Upon arriving at home, introduce your new dog to your home by walking him around all of the rooms on a leash. Proceed around the home, allowing Fido to lead the way for 15 to 30 minutes, recommends the Chesapeake Bay Retriever Relief & Rescue website. Once he has a good idea of his new home's layout, bring him to his crate and allow him to explore it. For his first few weeks or months, use the crate to provide your pooch with a safe haven. While he gets used to the new space and routine, allow him to spend time in his crate so he doesn't become overwhelmed by the stress of his new environment. Rescue pups may have had unpleasant experiences with people in the past and many such dogs may not have been socialized to people properly, according to the Partnership for Animal Welfare. For the first few weeks in your home, provide Fido with treats whenever he spends time with you or when he meets a new family member or friend. Don't force him to take these treats from your hand, but rather place them in front of him. Keep all of Fido's interactions with each person positive, calm and gentle, accompanied with praise. Soon, he'll learn that spending time with his new family and people is something wonderful that results in rewards. 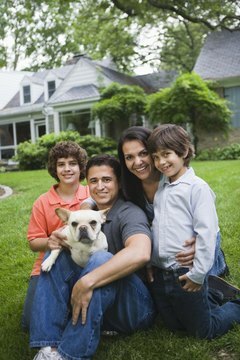 Dogs are creatures of habit and appreciate the stability provided by a consistent daily routine in their new home, recommends VeterinaryPartner.com. Starting on the day you get your pup, feed him at the same times each day so Fido knows when to expect meals. Rescue pups may not have been fed regularly in the past. Provide potty breaks first thing in the morning, after meals and at night. Walk your pooch out to the same spot each time when outside and give him the command "Potty." When Fido does his business, reward him with praise and treats. Once he becomes accustomed to his routine, Fido shouldn't have any accidents inside or fear that you won't feed him regularly, allowing him to relax and settle into your home. If possible, ask the personnel at the shelter Fido what type of food they were feeding him. Avoid problems with gastrointestinal upset by keeping your new addition on this same diet or slowly transition him onto a food of your choice. Change his old food for his new one in quarter portion increments every few days, until he's eating only his new food. After your dog becomes acclimated to your home, schedule and family, slowly introduce him to your other pets. First allow them to meet through a baby gate and later on a leash. Always keep meetings positive and reward both pets with treats for nonaggressive behavior while around each other.